One of our main priorities when building tours is creating a product of exceptional value. Cognition comes through comparison, so we decided to have an investigation of our own. In the table below are the results we got comparing the most popular Spain tours available on the market with our comprehensive Spain small group tour - Treasures of Southern Spain. First impressions matter a lot, especially if they're ruined from the very start when a fortune was spent on a ride to the hotel from the airport. When booking with us, we guarantee that you'll be met personally at the airport by our representative holding a sign. And there's no room for worry because round-trip airport transfers with safe drivers are included in the overall tour price (no hidden fees, we promise). As for hotels, you can be sure that the places you'll be staying at are all well-rated, comfortable and centrally located near major city attractions. We hand-pick the hotels ourselves as to double check that we offer you only the best options. Is a tour group of 30 or more travelers a convenient way to explore a destination? We don't think so. That's why our small group tours of Spain have no more than 14 people because this makes for well-paced and regardant touring. What is more, our tours begin on your arrival day, meaning that the travel days when you depart from your hometown and fly overseas don't count as program days you're paying for (like it's done by the competing companies we compared our tour to). Getting to know a city with a professional guide is also important, this is another reason why we form tour groups no larger than 14 travelers - to ensure top city tours with all main highlights. We're all about the experience, so we include entrance tickets to main landmarks and love to give our tourists special cultural treats instead of offering them as optional tours. 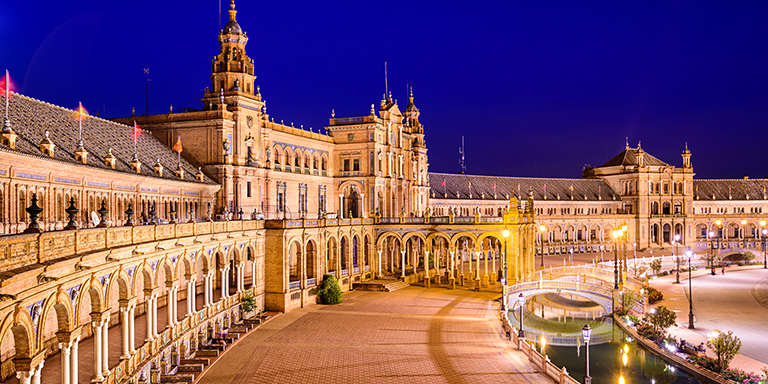 This said, with our tour you enjoy a Flamenco Show in Seville and enter the Alhambra Fortress in Granada, meaning you don't have to pay extra to visit simply unmissable locations. When looking into a tour's included transport we strongly believe that varied transportation, like scenic train rides and private transfers for small groups, leave better impressions of the overall trip than traveling in big tourist buses designed to carry 50 passengers. Why? Simply because traffic and time spent waiting for all members of a large group to gather and get seated on a coach while moving from destination to destination wastes hours and hours of precious vacation time. And we base these thoughts on years of travel planning and our experienced in-house logistics. It doesn't end here, you can always count on our support and assistance during your trip as you can easily reach us on the emergency line. And last but not least our small group tour of Spain has a great special offer gifting 1 complimentary day in Madrid with a carefully-planned exclusive day trip to El Escorial, the historical residence of the Spanish King. We hope this comparison will be helpful and will show you the overall value of our Spain group tours. Perfection always hides in the smallest details and we do our best to make sure all of our trips are seamless, comfortable and memorable for our valued customers. Our destination specialists are always happy to assist you in planning an amazing journey. So whenever you are ready, don't hesitate to contact us.